Fossil animals found in Arctic Canada provide a snapshot of fish evolving into land animals, according to research by scientists which was published in 2006. The finds gave researchers a fascinating insight into this key stage in the evolution of life on Earth. US palaeontologists published details of the fossil 'missing links' in the prestigious journal, Nature. The 383 million year-old specimens were described as crocodile-like animals with fins instead of limbs that probably lived in shallow water. Before these finds came to light, palaeontologists knew that lobe-finned fishes evolved into land-living creatures during the Devonian period. But the fossil record showed a gap between Panderichthys, a fish that lived about 385 million years ago which shows early signs of evolving land-friendly features, and Acanthostega, the earliest known tetrapod (four-limbed animals) dating from about 365 million years ago. In 1999, palaeontologists Professor Neil Shubin of the University of Chicago and Professor Edward Daeschler, from the Academy of Natural Sciences in Philadelphia set out to explore the Canadian Arctic in an attempt to find the 'missing link' that would explain the transition from water to land. After several years of searching with very little success, they hit the jackpot in 2004. The really remarkable find came when one of the crew found a snout of a flat-headed animal sticking out of the side of a cliff - something that is precisely what one would want to find because, with a bit of luck, the rest of the skeleton may be back in the cliff, at least according to Professor Shubin. 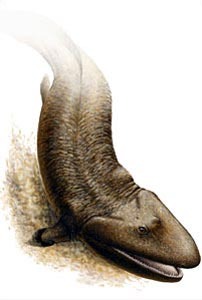 The team found three near-complete, well-preserved fossils of the new species, Tiktaalik roseae, in an area of the Arctic called the Nunavut Territory. The largest measured almost three metres (nine feet) in length. When the team got back into the lab they removed the rock from the bone, and began to make some really significant findings. The creature shares some characteristics with a fish; it has fins with webbing, and scales on its back. But it also has many features in common with land animals, such as a flat, crocodile-like head with eyes positioned on top and the beginnings of a neck - something not seen in fish. When the team looked inside the fin, they saw a shoulder, an elbow, and an early version of a wrist, which was very similar to that of all animals that also walk on land. The scientists believed the position of the creature's eyes suggested that it probably lived in shallow water. They stated that they had captured a very significant transition at a key moment in time. What was significant about the animal was that it was a fossil that blurred the distinction between two forms of life - between an animal that lived in water and an animal that lived on land. Dr Andrew Milner, a palaeontologist from the Natural History Museum, UK, said at the time that was unusual to find a fossil like this in such good condition. He found the material to be amazing because it included a nearly complete skeleton - which is always handy because, instead of assembling the fossil from bits, it was possible to see the whole skeleton and be sure that this is how the animal was put together. Professor Jennifer Clack, from the University of Cambridge, said that the find could prove to be as much of an 'evolutionary icon' as Archaeopteryx - an animal believed to mark the transition from reptiles to birds. 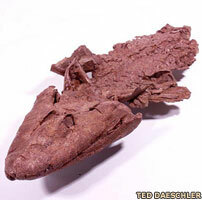 The discovery of the Tiktaalik provided hope of equally ground-breaking finds to come. A cast of one of the fossils was on display at the Science Museum in London from April 2006.